My son has really gotten into “adventures” which thankfully at his age can be something as pedestrian as going to Home Depot. So one day I had taken off work early to attend an event at his pre-school and afterwards he wanted to go on an adventure together. We went several places but eventually found ourselves at the mall as it was a hot day and they have an indoor play area. He ran around that for a little while before deciding that he wanted to ride some of the kiddie rides at the other end of the mall. Knowing that I had no cash and hoping that the change machine in the ride area took cards, we walked over. Unfortunately it only accepted bills so (while prying my disappointed son from the school bus ride) I told him that I had to try and get some money first. This entire exchange was somewhat conspicuously being observed by a young mother there with her two children who were also enjoying the kiddie rides. Finally locating an ATM with a dubious bank association and a $3.50 convenience charge, I reluctantly swiped my card, input my PIN, and agreed to the extortion fee. The machine then emitted the requisite currency dispensing noises minus the actual currency. The screen thanked me for my business and yet the cash dispensation drawer remained empty. Just about that time, two young men approached the machine with a mall security guard in tow. 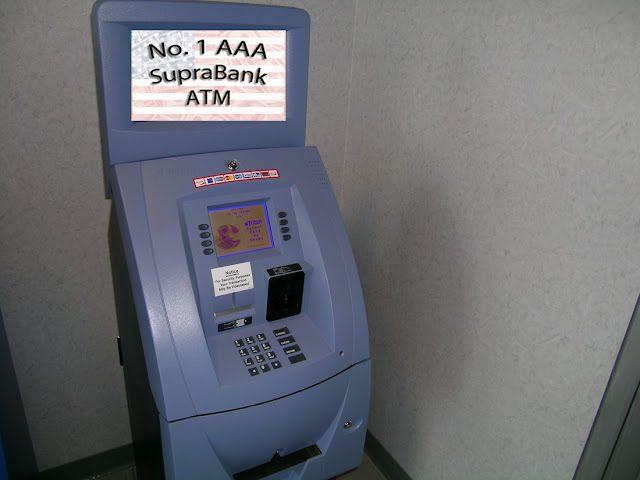 Apparently their ATM experience mirrored my own and they had enlisted the guard’s assistance in resolving the issue. He gamely looked the machine over and shrugged his shoulders before calling for backup. The second guard appeared and performed his own visual once-over before declaring that the ATM “hasn’t been acting right” and that we should probably call the 800 number listed on the side and get out money back. I immediately called the number and was told that there was “an unusually high call volume” pertaining to ATM issues so I went back to the main menu and selected the option for the sales department. Shockingly, it was adequately staffed and my call was answered. The associate informed me that there was nothing that he could do and that I should probably call my bank to have them stop the transaction. By this point, my son was becoming impatient (as toddlers do) that daddy had been standing at an ATM for 15 minutes and somehow still was unable to produce any money. So, as I began dialing my bank, I started walking with him in the general direction of the rides thinking that I might have seen a second ATM further down. Having arrived back at the rides, I noticed that the same mother and her two kids were still there. Frustrated with the entire situation and trying to explain to my bank that another bank’s ATM had taken my money, I dismissed my son’s repeated pleas for quarters to ride the school bus with an unnecessarily curt “Daddy’s busy. Why don’t you just sit on the ride and pretend we put quarters in it?” Amazingly, he found this to be an acceptable compromise and began gleefully rocking his body back and forth while making engine noises on the stationary ride. Moved by the scene of this poor young man whose deadbeat father would apparently rather have his son pretend to ride something than to part with a quarter, the young mother approached me and indicated that should would like to pay for him to actually get to enjoy the ride. Simultaneously moved by her kindness and embarrassed by its implication, I made a bumbling attempt to explain that I was not too cheap to part with a quarter but that the mall ATM had stolen my money and I was calling two different banks to prevent $23.50 from being removed from my account. This is, of course, the kind of thing a publicly shamed cheapskate would say. I again thanked her for her generosity and she was polite enough to pretend she bought my story before walking off with her kids. When I finally got someone from the bank on the phone, my son kept loudly insisting that he explain to them what had happened and why their "broke machine" had prevented the lights on the school bus ride from properly activating. As it turns out, the ATM did not even attempt to communicate with my account so I had the same chance of getting cash out of it as I would have swiping my debit card on a napkin dispenser. The entire setup may have been a decoy box to acquire the Debit Card info and PIN numbers of naïve teenagers and desperate parents. Next time I will just talk him into a emoji pillow from one of the kiosk vendors. Cancel that card and get a new one. It may very well have been a Skimmer.